Two sisters, Bree (Noone) and Jonna (Park), meet up after having been apart for three years. Their choice of venue is the local aqua centre. Bree is there first, and when Jonna arrives their shared history prompts a less than happy reunion. Attempting to patch things up, the sisters have a swim but they’re not in the water long before the manager (Bell) announces the pool is closing early for the bank holiday weekend. As they get ready to leave, Bree realises she’s lost her engagement ring. When Jonna spots it at the bottom of the pool, wedged in a grate, the two sisters both try to free it, but in the process Jonna’s hair becomes trapped in the grate. While Bree tries to help Jonna free herself, the manager activates the fibreglass cover and the women surface to find themselves trapped beneath it. 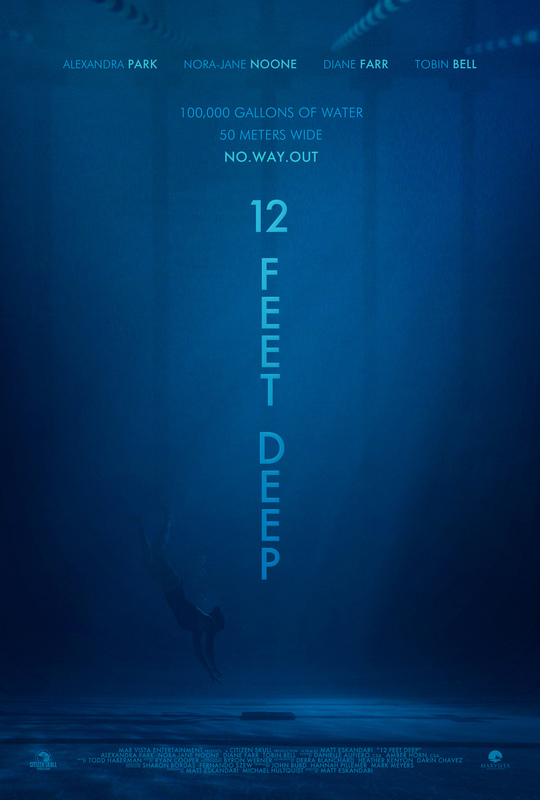 Now at this point in 12 Feet Deep, and with the bulk of the running time still to be played out, the average viewer may well be wondering where the movie will be going next. Obviously the sisters will attempt to find a way out of their predicament, and obviously the animosity borne out of their past history will push itself to the fore (and more than once), while Bree’s diabetes will also factor itself in (where would these stories be if one of the characters didn’t have some kind of medical condition that the situation would aggravate?). Perhaps the manager will remember something he’s forgotten, and return in time to save the day. 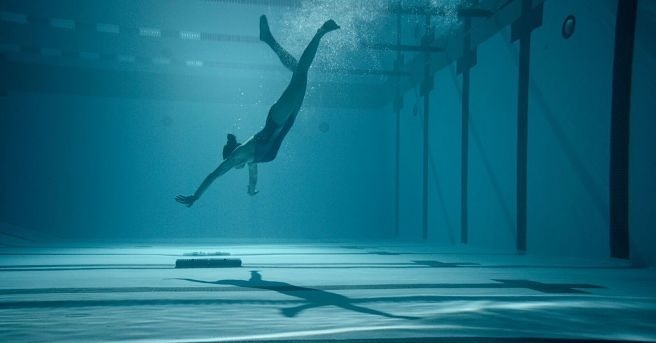 Or maybe Bree’s fiancé, David (Blackburn), will start to worry when she doesn’t come home and trace her whereabouts back to the pool, and save the day himself. Or perhaps there’ll be an alternative development, something unexpected or unforeseen that will heighten the tension of the sisters’ misfortune. In the end the route the movie takes is certainly an unexpected one. Jonna soon adopts a pessimistic “we’re both doomed” attitude while Bree tries to be more positive and problem solve her way out of their dilemma. She also manages to retrieve her ring and in the process discovers that the grate is loose. But she’s unable to free it completely. The only apparent hope they have of getting out is to use a piece of broken plastic to carve away at an opening in the cover, but this is likely to take them forever (or at least until the pool reopens). The sisters bicker and rake over painful childhood memories, and then the script – by director Eskandari and co-writer Michael Hultquist – reveals its trump card: the centre’s cleaner, Clara (Farr). Or, rather, it reintroduces her. Clara has been seen earlier rifling through some of the other customers’ bags and stealing money from them. We’ve seen the manager catch her in the act, but instead of firing her on the spot, he laments the fact he’s just written a glowing reference to her parole officer, and then tells her to finish up her shift. It’s such a clumsy, unbelievable thing for him to have done that anyone paying attention would have wondered why we were ever introduced to her. But Eskandari and Hultquist have further plans for her. Duly finishing up her shift, Clara becomes aware of the sisters’ presence under the fibreglass cover and does what any self-respecting parolee would do: she keeps them trapped and coerces Bree into revealing the pin code for her bank card (Clara has financial problems that take precedence over any ambition to be a heroine). From the moment it becomes obvious that Clara is going to make the sisters’ predicament even worse, the movie throws itself into a deep end of its own making, and presents the viewer with a succession of scenes that fail to make any dramatic sense whatsoever. The remainder of the movie is so poorly thought out that it never recovers from Clara’s reappearance and invidious behaviour. Any unease or trepidation as to how Bree and Jonna will eventually escape their potentially watery grave is abandoned in favour of a credibility-free exercise in cat-and-mouse theatrics that kills the movie’s ambition of being a nail-biting thriller absolutely and completely stone dead. Eskandari and Hultquist attempt to make Clara a disquieting and menacing figure, but fail to make the motivations for her actions even remotely convincing, and in doing so give Farr what may well be the most impossible acting challenge of 2016. That she navigates her tortured dialogue as well as she does is a tribute to her skill as an actress, and a blessing for the viewer; in the hands of some actresses Clara could have been the character equivalent of road kill. As Jonna and Bree, Park and Noone also fare better than the script should have allowed them to, and though there’s no physical resemblance between them, they’re more than credible as sisters. As the movie progresses the childhood trauma that is the source of the animosity they share is revealed piece by piece, and Noone, whose job it is to reveal it, overcomes a great deal of awkward dialogue in order to do so effectively. It’s a heavily manufactured trauma that doesn’t add to the situation they find themselves in, and like much else in the movie, lacks any resonance or depth except that, against the odds, Noone and Park manage to give it. On the very meagre plus side, Byron Werner’s strategically astute cinematography is a plus that at least allows the movie to appear more gripping than it actually is, and Vincent Albo’s claustrophobic production design enhances the sisters’ physical quandary. Rating: 3/10 – what could have been a tense, gripping examination of the plight of two women in a life-threatening situation is undermined by atrocious plotting, an incredibly weak justification for Clara’s behaviour, and too many scenes that should have been rewritten before shooting began; all these things make 12 Feet Deep a chore to watch, and massively disappointing, but the performances offer strong mitigation against the daft scenario, and they also provide occasional bouts of relief from the woeful material on hand.